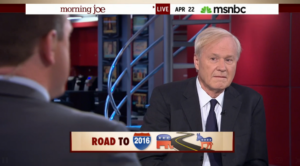 Apparently for Matthews, who jumped on the Hillary bandwagon last year, she can do no wrong. While it may be true that she will not suffer any long-lasting damage from her missteps over the last week and a half, it’s the accumulation of things that she has done that may cost her the nomination. I’ve seen the Hillary everybody likes who knows her, which is, and don’t take this the wrong way: girlish, fun, upbeat, exuberant, totally unafraid of commentary. Then there is the one in public who is aware her worst enemies are watching her, ready to get a jump on her…Maybe it’s years of being hit. Or maybe the girlish, fun, upbeat and exuberant Hillary only exists in Matthews’ mind—because that’s the first time I’ve ever heard those words used to describe her.